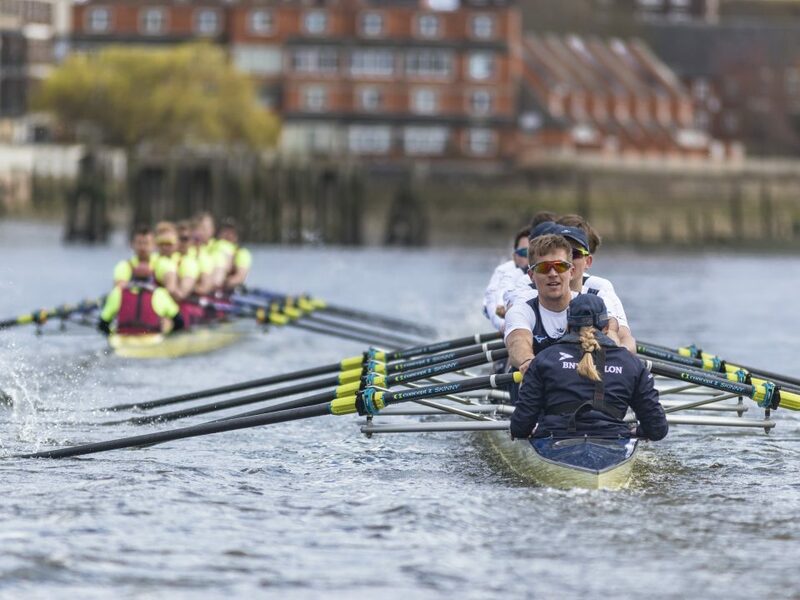 This weekend saw the rescheduled ‘Oxford Derby’ between Oxford University and Oxford Brookes University. A change in crew lineup for OUBC saw Ben Landis move to the 6 seat and Jamie Kirkwood subbed in at 2 as President Felix Drinkall was rested. The first piece was held between Chiswick Steps and Beverley Brook, Oxford University won the coin toss, and chose to begin on Surrey station. As the crews aligned, the water flattened and moments later the umpire’s flag came down. The battle commenced. From the word ‘go,’ Brookes had the upper hand from a stronger start, instantly beginning to inch away from their opposition, whilst both crews were warned on multiple occasions to move apart as the possibility of a blade clash grew more likely by the second, this potentially disastrous occurrence never had the chance to appear, as by the time the crews reached Hammersmith Bridge Brookes had opened up clear water between them and Oxford. At the famous Harrods Furniture Depository the Blue Boat looked set to make a charge, and thus Brookes were again warned to move across to their station, and with the cox of Brookes slow to react it was fortunate that Oxford failed to regain contact. At the conclusion at the first piece Brookes finished well ahead of the Oxford Blue Boat, and after a quick pause both crews made their way back up the river towards Chiswick whilst being debriefed by their coaches. Once back at Chiswick steps, the crews reversed their stations meaning Brookes now took the Surrey Station, and Oxford claimed the Middlesex Station. Despite a stronger start for Oxford, it didn’t take long before the strength of Brookes began to wear them down. Both crews held level off the start, amid more warnings from the umpire to remain apart. Despite this better start for Oxford, Brookes had gained a 3/4 of a length lead by the time the crews passed through Hammersmith Bridge, and at Harrods Depository there was clear water between both crews. As the two varsity crews neared the end of the course, Brookes stretched their lead over Oxford despite the best efforts of their opposition. At the conclusion of the days racing, Oxford Brookes came away having beaten their local challenger, Oxford University. Brookes are consistently ranked as the top rowing university in Europe, and as such, no one expected anything but a hard fought race. As The Boat Race draws closer day by day, the context of these results will not be known or understood until Cambridge challenge Brookes on the Thames next weekend.